Henry, 3rd Earl of Lancaster. 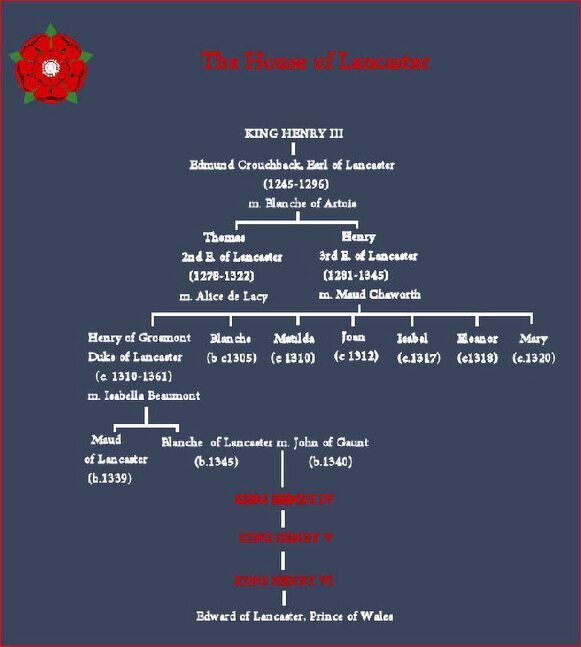 Henry of Lancaster, who was born circa 1281, was the younger son of Edmund Crouchback, 1st Earl of Lancaster and Blanche of Artois, the daughter of Count Robert I of Artois and Matilda of Brabant and a granddaughter of King Louis VIII of France. His father Edmund Crouchback was the younger son of King Henry III of England and Eleanor of Provence and brother of King Edward I. 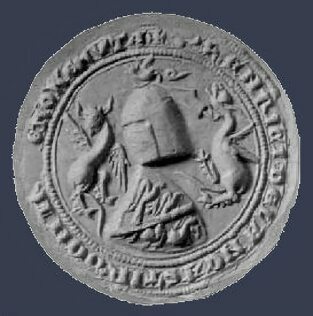 On the death of their father at the siege of Bordeaux in 1296, Henry's elder brother Thomas, succeeded to his titles and estates as 2nd Earl of Lancaster. Henry accompanied his uncle King Edward I both on his French and Scottish campaigns, he fought in the Battle of Falkirk 22 July 1298 and was present at the Siege of Caerlaverock in 1300. During the reign of his cousin Edward II, Henry was among the lords ordainer, a group of nobles who attempted to force King Edward to provide better government for the kingdom. Following the execution of the kings detested favourite, Piers Gaveston in 1312, by the Earl of Warwick and Henry's brother, Thomas, Earl of Lancaster, Henry was among the lords who received a pardon and seems to have remained on relatively good terms with his cousin the king for the remainder of his reign. Thomas Earl of Lancaster rose in rebellion against King Edward II for a second time and was tried and convicted of treason, for which he was executed near his castle of Pontefract and had his lands and titles forfeited to the crown in 1322. Henry, who took no part in his brother's rebellion, petitioned for the restoration of his brother's lands and titles, and on 29 March 1324 was invested with one of his titles, Earl of Leicester. (1) Henry of Grosmont, Earl of Derby, (about 1300-1360/61) m. Isabella, daughter of Henry, Lord Beaumont, they became the parents of Blanche of Lancaster, the wife of John of Gaunt, 3rd surviving son of Edward III and became the mother of Henry IV, first king of the Lancastrian line. (2) Blanche of Lancaster, (about 1305 - 1380) married Thomas Wake, 2nd Baron Wake of Liddell. (3) Matilda of Lancaster, (c. 1310- 5 May 1377) married William de Burgh, 3rd Earl of Ulster in 1327. They had one child, Elizabeth de Burgh, born 6 July 1332, who married Lionel of Antwerp, 1st Duke of Clarence, second son of Edward III on 15 August 1352 at the Tower of London and had a daughter Phillipa Plantagenet, who became the ancestress of the House of York. Matilda of Lancaster was married for a second time in 1344 to Ralph Ufford and had another daughter, Maud Ufford. (4) Joan of Lancaster, (about 1312-1345); married John de Mowbray, 3rd Baron Mowbray and had three children, Blanche de Mowbray (died 1409), married firstly John Segrave, secondly Robert Bertram, thirdly Thomas Poynings, fourthly Sir John Worth, and fifthly Sir John Wiltshire. Eleanor de Mowbray, married firstly Roger La Warre, Lord La Warre and secondly Sir Lewis de Clifford. John de Mowbray, 4th Baron Mowbray (25 June 1340-1368), who married Elizabeth de Segrave. (6) Eleanor of Lancaster, (about 1318-1371/72) married (1) John De Beaumont and (2) 5 Feb. 1344/5, Richard FitzAlan, 10th Earl of Arundel and became the mother Joan FitzAlan (1347/1348 - 7 April 1419), who married Humphrey de Bohun, 7th Earl of Hereford and became the mother of Mary de Bohun, who was in turn the mother of King Henry V.
(7) Mary of Lancaster, (about 1320-1362), who married Henry de Percy, 3rd Baron Percy, and was the mother of Henry Percy, 1st Earl of Northumberland and the great grandmother of Harry Hotspur. Maud de Chaworth died in 1322, at the age of forty and was interred at Montisfont Priory, of which she had been a patron. Edward II's neglected Queen, Isabella of France and her lover Roger Mortimer, 1st Earl of March arriving in England from France, led a rebellion against her husband and his despised favourites Hugh le Despenser, 1st Earl of Winchester, and his son Hugh the younger Despenser. Isabella was Henry's niece through his mother Blanche of Artois, weary of Edward's weak government of the kingdom Henry joined the rebellion in September 1326, which resulted in a general defection to Isabella's side by the other nobles. Henry was dispatched to take custody of Edward, who was captured at Neath Abbey in South Wales, he was detained at Henry's castle of Kenilworth and Henry was a member of the deputation that informed Edward of his deposition. Edward was later murdered at Berkeley Castle in a bestial manner. 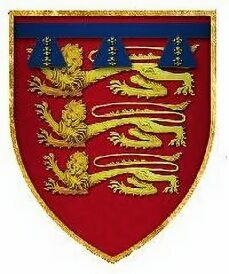 Following the accession, in 1327, of the young Edward III, he was made chief of the Council of Regency, and after entering a petition in Parliament the earldom of earldom of Lancaster was restored to him, along with the lordship of Bowland. Henry remained loyal to the new government for the first two years of the regency of Isabella and Mortimer, he took part in a number of campaigns in Scotland that culminated in the Treaty of Edinburgh, but later quarreled with Roger Mortimer and complained that the Council of Regency was ignored, he consequently refused to attend the Salisbury Parliament of October 1328. Although he gathered troops at Winchester, he was compelled to make peace. In 1330, in alliance with Edmund, Earls of Kent and Thomas Earl of Norfolk, the brothers of the late Edward II, he rose in rebellion against Roger Mortimer, but was forced into submission. His son Henry was one of the instigators of the plot that overthrew Mortimer and led to the latters execution. About this time his eyesight failed, and after Mortimer's fall Henry retired from public life, although was often represented in Parliament by his son Henry. Henry died on 22 September 1345, and was buried on the north side of the high altar of Newark Abbey, Leicester. his titles and estates passed to his only son Henry of Grosmont.